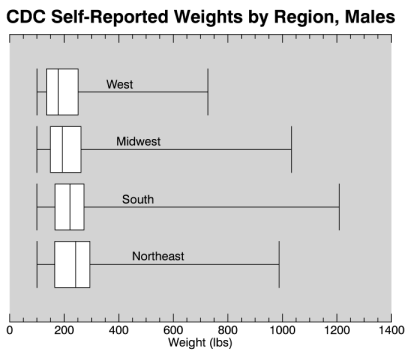 The BOXPLOT function creates a box and whiskers plot from a data series containing a sample minimum, lower quartile, median, upper quartile, and sample maximum. ; Change some of the properties after creating the plot. 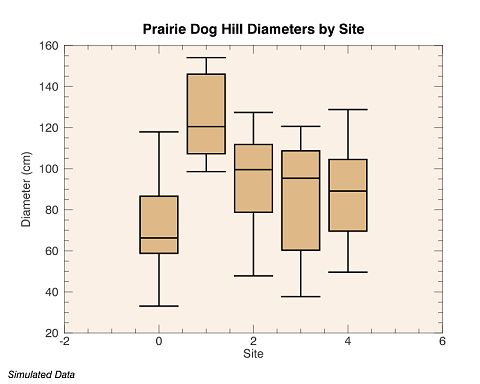 See BOXPLOT Examples for additional examples using the BOXPLOT function. The BOXPLOT function returns a reference to the created graphic. Use the returned reference to manipulate the graphic after creation by changing properties or calling methods. An M-element vector where M is the number of boxes representing the abscissa values to be plotted. If Locations is not specified, Values is plotted as a function of point numbers starting at zero. If both arguments are provided, Values is plotted as a function of Locations. If HORIZONTAL is set, these values will be located on the y-axis. If HORIZONTAL is not set (the default), these values will be located on the x-axis. An M x 5 element array defining the minimum, lower quartile, median, upper quartile, and maximum values to be represented in the box and whiskers. If HORIZONTAL is set, these values will be positioned along the x-axis. If HORIZONTAL is not set (the default), these values will be positioned along the y-axis. See CREATEBOXPLOTDATA for additional details on defining the input values. Set this to an M-element array denoting the confidence interval value around the median for each box. CI_VALUES are used to define the boundaries of the notch around the median if a notch is displayed. If set to an invalid value, i.e., the number of values does not match the number of boxes, no notches will be displayed. The NOTCH keyword must also be set in order to display notches on the boxes. Set this to an M-element array containing the mean values to plot as symbols in each box. If set to an invalid value, i.e., the number of values does not match the number of boxes, no means will be displayed. Note: IDL will ignore values outside of the allowed input. Set this to a 2 x N-element array denoting up to N outlier values. For each value (x, y), x represents the box location and y represents the value at that location. If set to an invalid value (e.g., '0') no outliers will be displayed. Set this to a 2 x N-element array denoting up to N suspected outlier values. For each value (x, y), x represents the box location and y represents the value at that location. If set to an invalid value (e.g., '0') no outliers will be displayed. IDL will ignore values outside of the allowed input. By default, anti-aliasing is used when drawing lines. Set this property to 0 to disable anti-aliasing. Set this property to a floating-point value indicating the ratio of the Y dimension to the X dimension in data units. If this property is set to a nonzero value, the aspect ratio will be preserved as the graphic is stretched or shrunk. The default value is 0 for all graphics except images, meaning that the aspect ratio is not fixed but is allowed to change as the graphic is stretched or shrunk. Set this property to an integer between 0 and 100 to represent the percent transparency of the background color. The default is 100 (completely transparent). If you change the BACKGROUND_COLOR property and the current background transparency is 100, then the BACKGROUND_TRANSPARENCY will be automatically set to 0 (opaque) so that you can see the new color. Set this property to 1 (the default) to draw the primary box, or to 0 to disable drawing the boxes. Set this property equal to the color for the box and whisker lines. The default value is "black." Set this property to 1 to draw the endcap lines on the whiskers. Set to 0 to turn off the endcap lines. The default is to draw the endcap lines. Set this property equal to the color used to fill the box. If not set or set to 0, the box is not filled. If LOWER_COLOR is set, it will override the value of FILL_COLOR for the lower portion of the box. Set this property equal to the text color for the title and axes (if present). The default value is "black". Set this property equal to a string specifying the IDL or system font for the title and axes, if present. The default value is "DejaVuSans". Set this property equal to an integer specifying the font size for the title and axes, if present. The default value is 9 points for the axis text and 11 points for the title. If set, the boxes will be drawn horizontally (parallel to the x-axis). The default behavior is to draw vertical boxes (parallel to the y-axis). This is on a per boxplot basis; setting this property on a given boxplot will not affect any currently existing boxplots. Set this property to the line style used to draw the whiskers and endcap lines. The default value is a solid line. Set this property equal to the color used to fill the portion of the box below the median line. Setting this property will override the value of FILL_COLOR for the lower portion of the box. Set LOWER_COLOR to 0 to turn off the color in the lower portion of the box, which allows the box to be filled completely with the FILL_COLOR. LOWER_COLOR must be used in conjunction with FILL_COLOR. Set FILL_COLOR in order to enable the use of LOWER_COLOR. Set this keyword to draw a median line in each box. The default is to draw the median line. Set this property to a string that specifies the name of the graphic. The name can be used to retrieve the graphic using the brackets array notation. If NAME is not set then a default name is chosen based on the graphic type. Set this property to draw a notch at the median value using CI_VALUES. The default is not to draw a notch at the median value. Set this property to a four-element vector that determines the location of the visualization within the graphic window. The coordinates (x0, y0) represent the lower left and (x1, y1) represent the upper right corners of the data space. Coordinates are expressed in normalized units ranging from 0.0 to 1.0. If the DEVICE property is set, the units are given in device units (pixels). After creation, you can set the POSITION to either a two- or four-element vector. If two elements are provided, the center of the graphic will be translated to that position. If four elements are provided, the graphics will be translated and scaled to fit the position. Use this graphic symbol to control all of the symbol properties for the mean values, if specified. See SYMBOL for more information. Use this graphic symbol to control all of the symbol properties for the outlier values, if specified. See SYMBOL for more information. Use this graphic symbol to control all of the symbol properties for the suspected outlier values, if specified. See SYMBOL for more information. Set this property to a value between 0 and 10 to set the thickness of the line defining each box, the whiskers, and endcaps. A thickness of 0 displays a thin hairline on the chosen device. The default value is 1. Set this property to the percent transparency of the boxes and the lines. This value can be an integer between 0 and 100. The default value is 0. This property holds a user-defined value. Set this property to an IDL variable of any data type. If set to 1, the default, whisker lines will be drawn. Set this property to 0 to turn off the whiskers. Set this property to the width of lines denoting half of the box and whiskers (the span in the X direction for vertical boxes), in data units. The default is 0.4 ([location-0.4, location+0.4]). If set to an M-element array, each element will represent the width of the box at that index. Set this property to a two-element vector giving the X data range to plot. The default behavior is to plot the entire data range. Set this property to a two-element vector giving the Y data range to plot. The default behavior is to plot the entire data range.